Prevention in health care exists since long but more as a side product or process of hospital care and not as a core activity of the hospital. Beginning 21st century prevention became more on the forefront together with the increased attention for quality and patient safety. The Institute of Medicine (IOM) defined patient safety as “the prevention of harm to patients”. The financial crisis has pushed also the agenda for preventing (financial) risks in health care. The concept of preventive healthcare is growing, claiming its place aside more traditional activity spaces of the hospital, like cure & care, RD & technology, education & training…. In the United States, the Affordable Care Act has an effective preventive care plan requiring insurance companies, Medicare, and Medicaid to provide preventive care services for free. In Europe, the initiatives on hospital level have until now been limited and fragmented. Being concerned with the hospital of the future, the EAHM wants to push the agenda forward with this conference and other activities towards an integrated approach on prevention, based on the IMPO-model and the activity spaces of hospitals, focusing on the impact of prevention on the outcomes and processes of the hospital as well as on the necessarily necessary inputs and steering, supporting and guiding the appropriate implementation of prevention with the hospital. During this conference, participants will learn about deployment and integration of tools, and techniques in the context of prevention. Advanced initiatives including the management perspective will be presented, stressing the preventive role of the hospital, embedded in a regional approach as well as contributing to the health care systems. 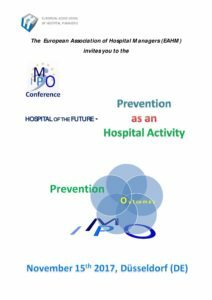 This conference will show that prevention deserves a more prominent place in the activity of the hospital. Furthermore prevention contributes better in the outcomes of the hospital and the health care system when supported by a managerial, integrated and networked approach. During this workshop we will use the IMPO-model which is based on the experience of hospital managers brought together by the European Association of Hospital Managers. The IMPO-model consists of 4 interconnected pillars: the aim is to ensure the Outcomes through Processes steered by the Management, given the (external) Inputs to the organization. This IMPO-Conference takes place on November 15th 2017 at 13:00, during Medica in Düsseldorf. This event is free of charge for members of the EAHM but requires online registration at www.eahm.eu.org. Other persons can join the conference by sending a request to sg@.eahm.eu.org. Your registration will be confirmed by email together with practical information. The conference will be translated simultaneously into English, German and French. This conference has been made possible with the support of our Core Partners.